NASA have an incredible depth and breadth of image data that they allow people to use pretty freely in various ways. For example, I had been reading up on the libration of the moon (the observed 'wobble' it undergoes as part of its normal orbit. This means more than 50% of the moons face is seen from Earth - in fact about 60%) and wanted to create a day-by-day sequence of images that showed what you would observe of the moons surface from Earth as both phase and libration changed. 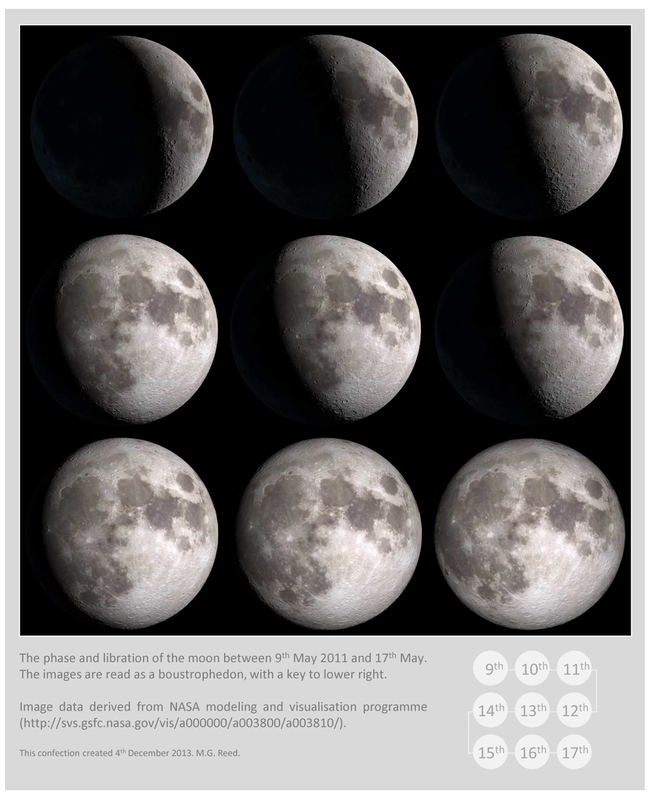 It so happens that NASA have a nice web interface that allows you to create hour-by-hour visualizations of the phase and libration of the moon based on their detailed moon surface topographic data. They also have nice video visualisations of these images. Above is a series of these images from 9th May 2011 to 17th May 2011. Each image is at 0 hours UT. I have arranged the images in boustrophedon fashion beginning top left. I found that this was the best way I could find so that each step in the image sequence is immediately 'adjacent' to the previous step and the next one. Note that these are not images captured from a ground based telescope, they are visualisations of data collected from a diverse set of experimental data - such as LOLA the Lunar Orbiter Laser Altimeter measurements of moon topography. Created from NASA/Goddard Space Flight Center Scientific Visualization Studio images from HERE.